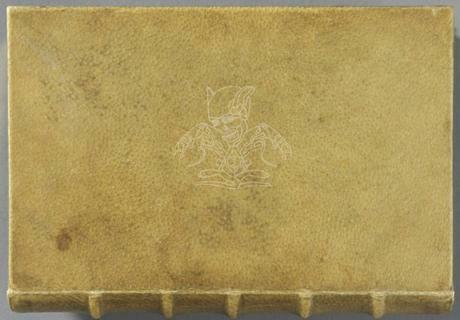 In April just passed Fool’s, Harvard University denied its Houghton Library contains books bound in human skin. When two of the three books named were quickly identified as sheepskin bound the Internet moved on. Harvard scientists led by director Bill Lane at Harvard Mass Spectrometry and Proteomics Resource Laboratory and Daniel Kirby of Straus Center for Conservation and Technical Studies announced today the results of their months-long toil, having performed Peptide Mass Fingerprinting on the third book we all forgot: a 19th century copy of poet Arsène Houssaye’s Des destinées de l’ame is indeed bound in human skin. Tests rule out lower primates but not great apes and gibbons because Harvard did not have sample subjects to test the book’s binding against. Ghoulish to the contemporary imagination, the practice of anthropodermic bibliopegy (the technical term for “human skin bookbinding”) was not only fairly common in the 19th century, it had a social register we can today barely comprehend: these human books were in most cases memento moris that literally include a body part from one’s dearly departed, like Victorian hair jewelry. Alternatively, the confessions of criminals were sometimes emblazoned on their tanned skins, though not then bound into books. The book has been in the collection since the 1930s, which means when Harvard acquired the volume it was not yet especially aged.